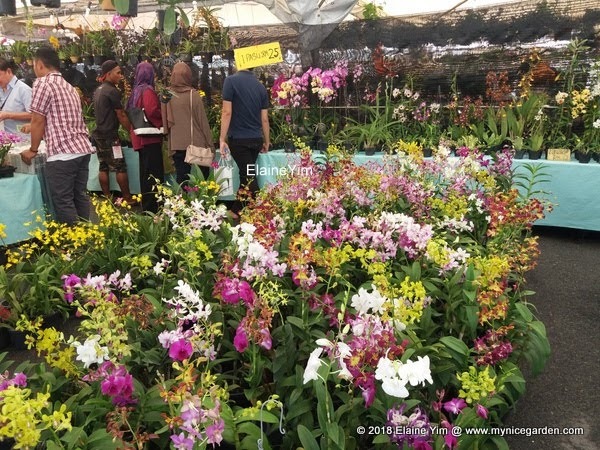 Royal Floria Putrajaya 2018 will be held from 25 August - 2nd September 2018. For more photos and updates, please visit my Instagram here. Tickets can be purchased online at a discounted price by visiting Royal Floria Putrajaya 2018 official website here. You can also buy the tickets at the entrance but be prepared to queue and pay more. Decide carefully which day you want to visit as tickets purchased online are not refundable. Tickets for weekday (Mon-Thu) cannot be used on weekends (Fri-Sun) and vice versa. Tickets is also based on "per entry" basis, meaning that once you exit the venue, you can't enter again using the same ticket even though it is the same day. For Map: click here or use the keywords "Anjung Floria" to search in Google Maps, or WAZE. For public transport: take GRAB or taxi to Anjung Floria. There is no free bus shuttle service yet. 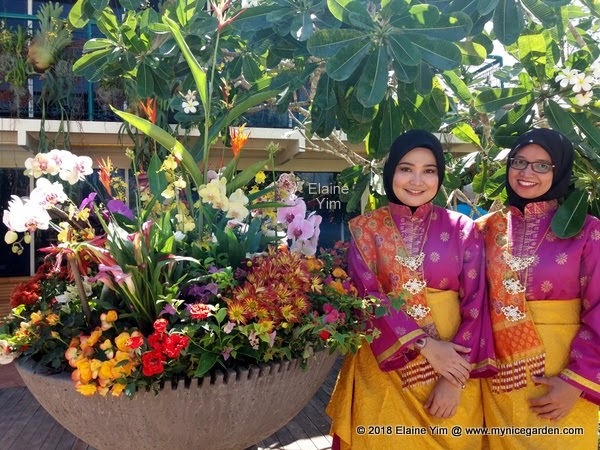 Royal Floria Putrajaya 2018 celebrates its 10th anniversary of Malaysia's largest and grandest flower and garden festival which has been held in Putrajaya since 2007. It returns after a 1 year hiatus. Remember, there was no Floria 2017. 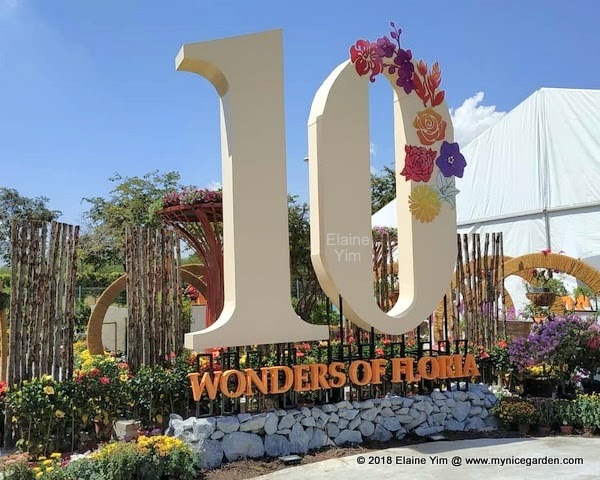 The main highlight of Royal Floria Putrajaya 2018 is this outdoor show garden called the "10 Wonders of Floria". Once inside this show garden, the walking path will you lead to several mini-gardens and a walk down memory lane to re-visit all the the theme flowers of yesteryear Florias. The flowers are HIBISCUS - 2007, ORCHID - 2009, HELICONIA - 2010, ROSES - 2011, BOUGAINVILLEA - 2012, ORCHID - 2013, BEGONIA - 2014, LILY - 2015 and CHRYSANTHEMUM - 2016. 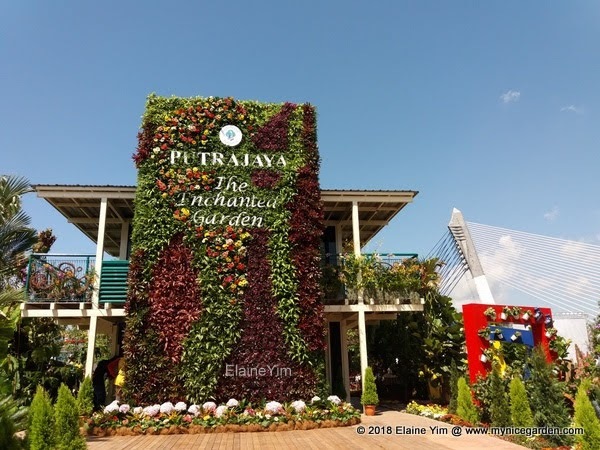 The theme of Perbadanan Putrajaya (PPj) show garden is "The Enchanted Garden, Where Life Begins..."
Look out for the Ovarium Building with a hologram showing the life cycle of dipterocarp plants from seed to tree. Here you will also see replicas of Taman Botani, Taman Wetland, Taman Warisan Pertanian, Taman Saujana Hijau, Taman Rimba Alam, Green Wall Panel, Paddy Plot, Climbing Wall, Wishing Tree, Traditional Kelulut Bee Hives, Scarecrow Man, Wetland Cell, English Bustan and bird sounds of doves. 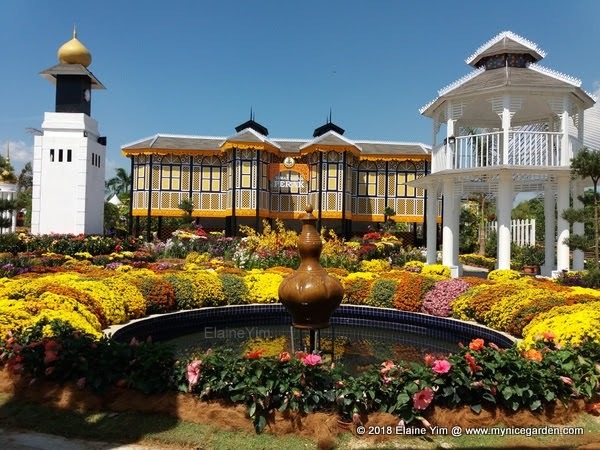 The Royal Garden of Floria 2018 is the Perak Royal Garden featuring Istana Kenangan in Kuala Kangsar, Pavilion Tower, the Kuala Kangsar Clock Tower, Istana Iskandariah and Ubudiah Mosque. The main entrance of the royal garden is based on Istana Iskandariah in Bukit Chandan while the popular Perak heritage handicraft item, the Labu Sayung is also featured. The show garden by Dewan Bandaraya Kuala Lumpur (DBKL) aka Kuala Lumpur City Council is usually among the most elaborate, grand and magical. 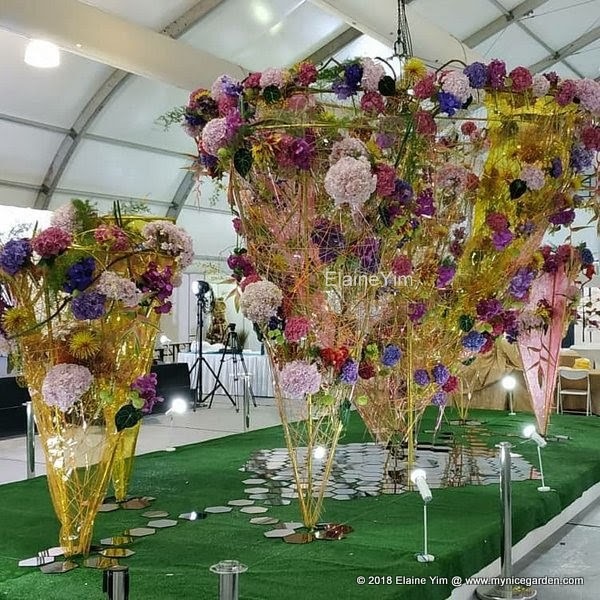 The DBKL show garden is titled "Rendezvous" signifying a meeting of 3 concepts that celebrates (1) all previoius theme flowers of floria, (2) all previous show gardens featured by DBKL and (3) our country's pre and post-independence eras and the future. Finally, the visitor will come face to face with a mirror where they see themselves meaning that "we are the ones who should appreciate and shape our country". 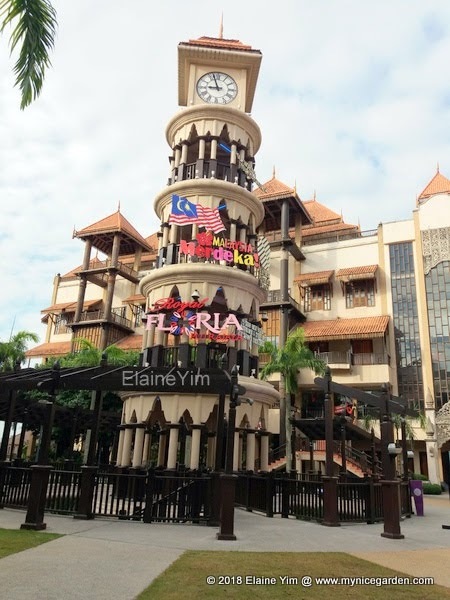 Rendezvous celebrates the 10th anniversary of Putrajaya Floria and our 61st Merdeka/National/Independence Day. 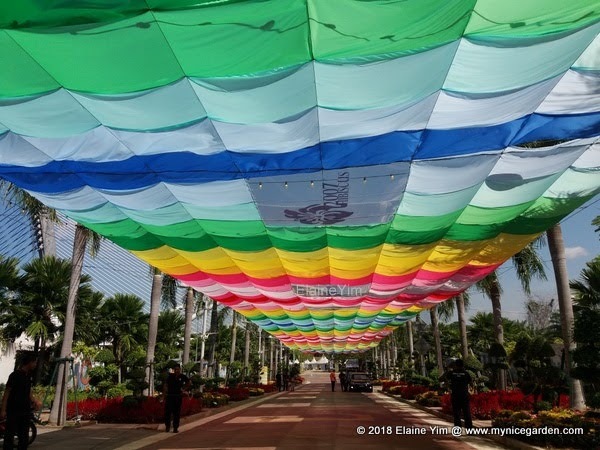 Royal Floria Putrajaya 2018 was officially declared open by Selangor ruler Sultan Sharafuddin Idris Shah on 25 August 2018. In the photo are from left, Deputy Prime Minister Datuk Seri Dr. Wan Azizah Wan Ismail, the Tengku Permaisuri of Selangor, Tengku Permaisuri Norashikin, Federal Territories Minister Khalid Abdul Samad and Puan Haslinda Khalid, CEO of Putrajaya Floria Sdn Bhd. The Indoor Floral Pavilion is perhaps the most interesting and comfortable place to view exhibits by local and international participants. Being fully air-conditioned, it is cool and a welcome respite from the sweltering heat outside. 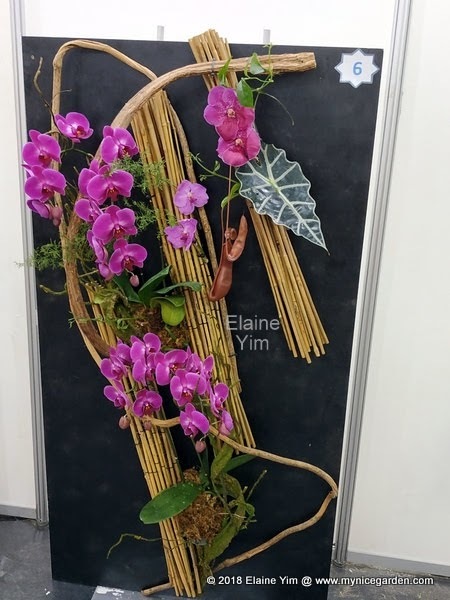 Every floral exhibit is professionally designed and painstakingly constructed with precision and full attention to details. Fresh flowers and living plants are used in the designs. 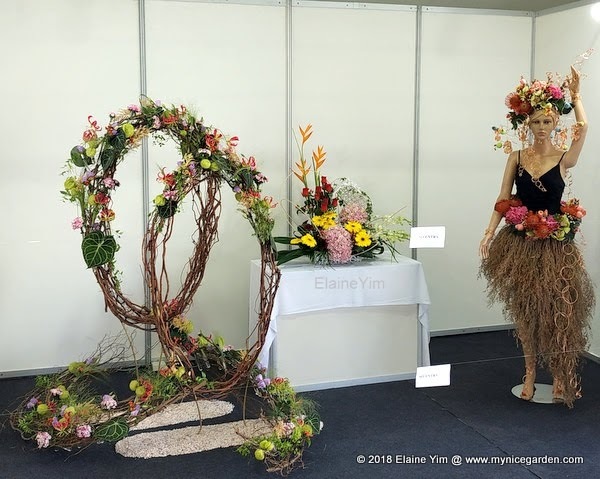 The designers are vying for the International Designers Competition, Creative Terrarium Competition, Miniature Garden Competition, Innovative Wall Art Competition, Suiseki and Wood Competition and the Royal Floria Cup Competition for local and international designers. The international designers are from Japan, Singapore, Germany, Philippines, Taiwan, Vietnam and Indonesia. This design by Lim Boon Yan of Malaysia won the "Merit Award" under the Innovative Wall Art Competition. 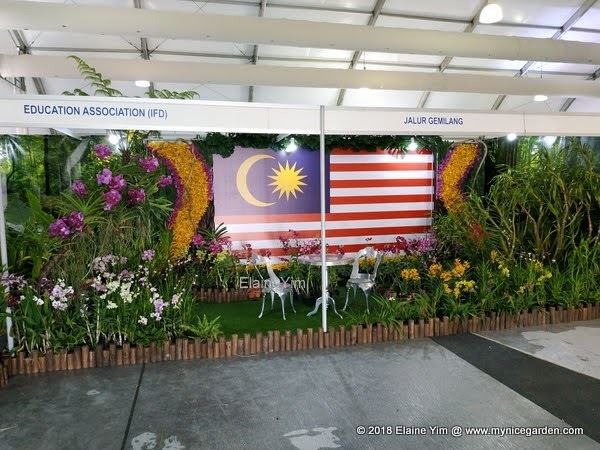 At the entrance to Indoor Flora Pavilion is the Orchid Gallery and Jalur Gemilang Malaysian Flag exhibit by the International Floral Design (IFD) Education Association. 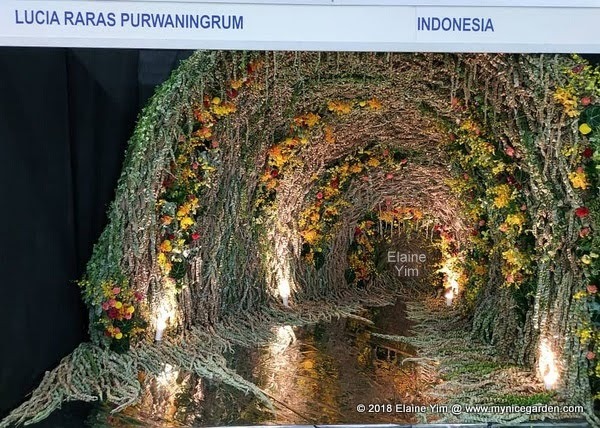 This design by Lucia Raras Purwaningrum of Indonesia is perhaps the most photographed exhibit. It won the "Popular Choice Award" under the International Designer category. Participation from the International Horticulture Goyang Korea. "Masterpieces" by World Floral Design Centre Sdn Bhd. This Miniature Garden designed by Low Teck Beng won the Gold Award for the Miniature Garden Competition. 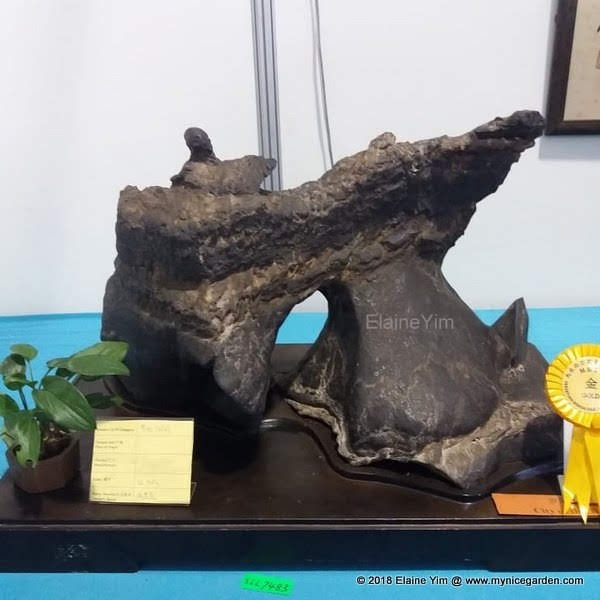 This exhibit by Surene Fong May Leng won the Gold Award for the Creative Terrarium Competition. There is a Suiseki (stone) and Wood Exhibition at the Indoor Floral Pavillion. This piece titled "Mystery of the Mountain" is a stone (suiseki) exhibit from the Malaysia Bonsai & Suiseki Society (MBSS). It won the Silver Award. This piece titled "City on the Road" is a stone (suiseki) exhibit from the Malaysia Bonsai & Suiseki Society (MBSS). It won the Gold Award. Suiseki stands for stone appreciation. Suiseki originated from China thousands of years ago. Many famous Chinese gardens such as the UNESCO World Heritage certified Classical Gardens of Suzhou used stones from Taihu Lake, Linbi stones from Anhui and Ying stones in the landscape and waterscape. Actually, Suiseki is derived from the Japanese words, "sui" for water and "seki" for stone. Stones in the shape of mountain, statue/figure of animal/human, abstract forms are preferred. The stone pieces are judged for their shape, colour, texture, quality, uniqueness and rarity. 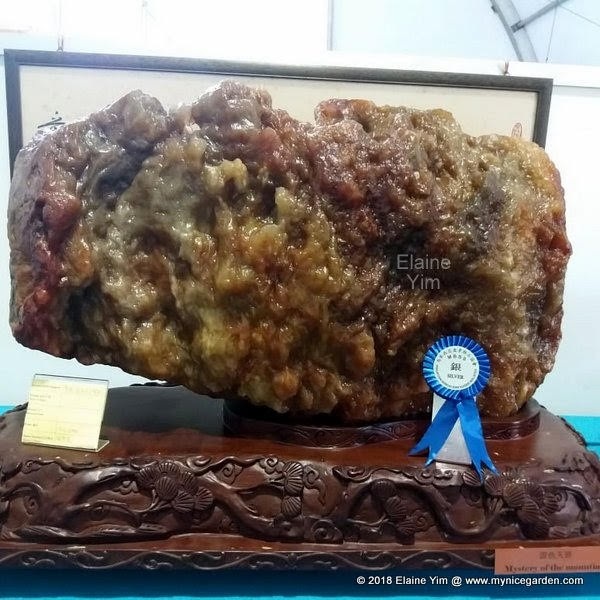 In Malaysia, you can find high quality suiseki stones from rivers such as Titi River in Sungei Siput while Kuala Trengganu is source for black stones; Kedah and Perlis for waxed stones. 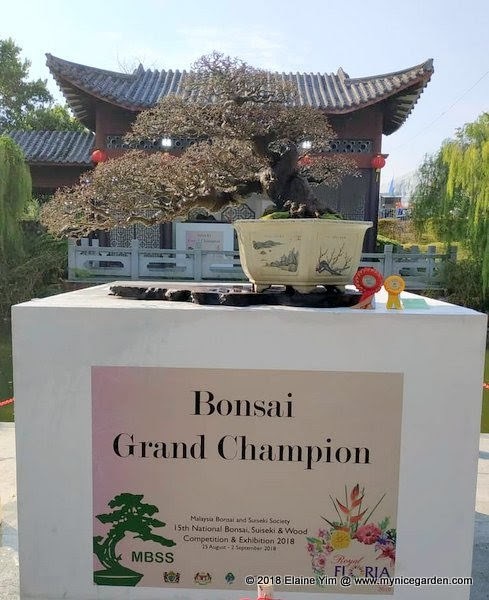 The Bonsai exhibition is held outdoors at another venue, at the China-Malaysia Friendship Garden. Bonsai is derived from the Japanese word "bon" meaning pot and "sai" meaning plant, hence "bonsai" means "plant in a pot". It is known as "penjing" in Chinese. Penjing originated from China more than 2000 years ago but it was made popular by the Japanese who named it bonsai. A bonsai is not merely a plant in a pot. Each bonsai is a piece of art and it takes many years to design, structure, care and maintain. The specimens are judged based on their age, root base, trunk, branches, flowers, fruits, leaves, accessories such as pots and overall appearance. 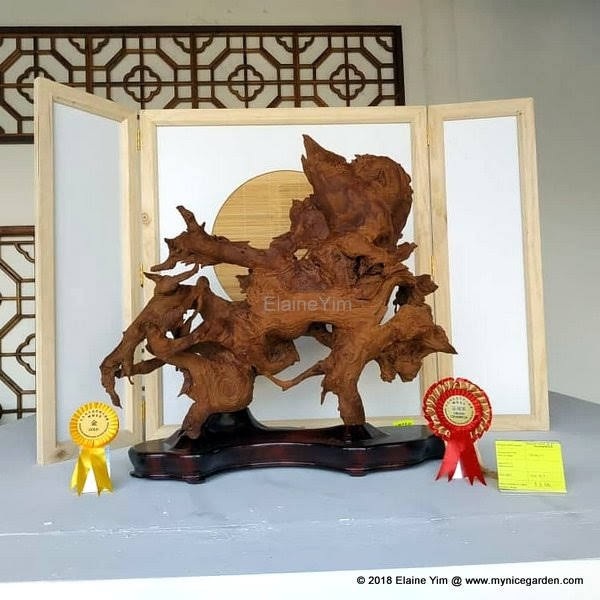 This piece won the Gold Award and the Wood Grand Champion award at the 15th National Bonsai, Suiseki and Wood Compeition & Exhibition 2018. It is displayed at the outdoor venue at China-Malaysia Friendship Garden. Interest in Wood as a form of art started in China thousands of years ago. The families of Imperial China used the very best quality wood such as rosewood and sandalwood for furniture and stationery. Wood appreciation is on the rise in Malaysia and the kayu raja, jayu kemining and drift wood are popular choices among wood art collectors here. Wood art is judged on based their contour lines, vein, texture, shape, color and appearance. The Garden Bazaar & Horticultural Market is another interesting place for bargains. There are a few orchid vendors selling blooming orchids (prices between RM 18 - RM 25 each) and orchid keikis at RM 8 each. One of them is United Malaysian Orchids Sdn Bhd. 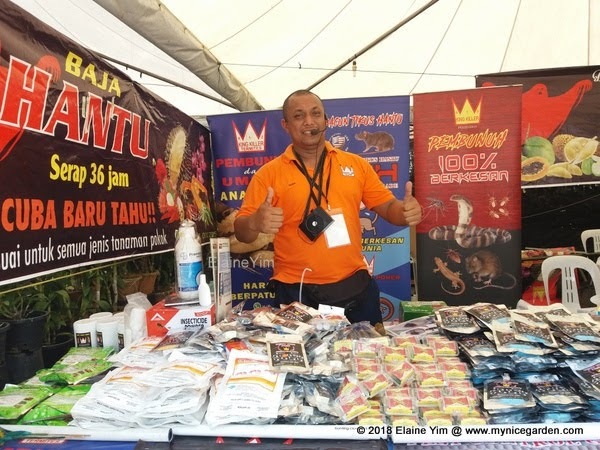 This vendor sells "Baja Hantu" fertilizer which they claim is suitable for all kinds of plants (from orchids and ornamentals to fruit trees) and pest control which they claim is "100% effective on snakes, rodents, white ants and lizards"! 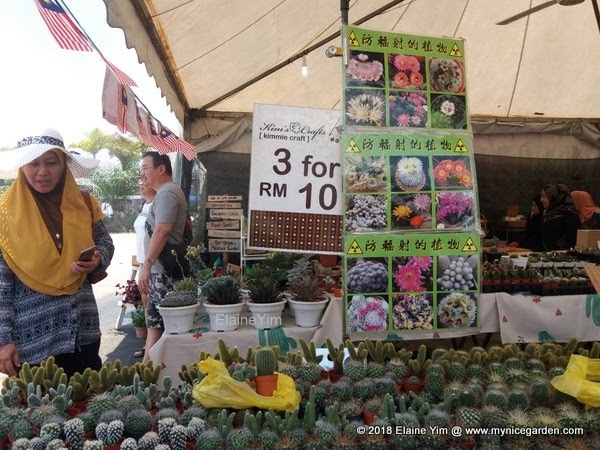 There are stalls selling succulents and cacti at RM 10 for 3 pots and also stalls selling ornamental plants, airplants (some at RM 10/piece and "buy 5 free 1"), tillandsias, fruit trees samplings, vegetable sees, herb and spice plants, fertilizer, flower pots, garden soil, bonsai and stone products. The Pullman Putrajaya Lakeside is the official hotel sponsor of Royal Floria Putrajaya 2018. The Royal Floral International Dialogue (RFID) Day 2 seminar is held at the Pullman Lakeside Putrajaya Hotel located at Precinct 5. At the Fantasy Garden at Anjung Floria Event Centre, Precinct 4, look out for the Pullman Putrajaya Lakeside Hotel booth as they are giving away free lollipops, popcorn, balloons, sweets and candies to children.